No polls today but there is a news item about the electoral college that may decide the presidency. It is a bit subtle, so if your knowledge of the electoral college is a bit rusty, dating back to a high school history class, you might want to check out our quickie electoral college refresher course. Here is what article II, section 1 of the constitution says about how the presidential electors are to be chosen. In other words, a state may choose its electors any way it wants to. Most states hold an election and the candidate with the most votes gets all the electors. In Maine and Nebraska, the winner of each congressional district gets one elector and the winner of the state as a whole gets two more. But the state legislature is free to just skip the election altogether to save the taxpayers money and just appoint the electors directly. The Colorado state legislature did precisely this in the bitterly contested election of 1876, in which the Democrat, Samuel Tilden won the popular vote over the Republican Rutherford B. Hayes. There were large-scale irregularities in (you guessed it) Florida, as well as South Carolina and Louisiana. The question of who would represent these states in the electoral college was highly disputed, so Congress appointed a 15-man commission consisting of seven Democrats, seven Republicans, and the Chief Justice of the Supreme Court to sort out the mess. To make a long story short, on a straight partisan vote, all the disputed states were resolved in favor of the Republicans and Hayes became president with 185 electoral votes to Tilden's 184. Remind you of George Santayana's observation that those who do not learn from history are doomed to repeat it? If you want to impress your friends with your deep knowledge of American history, start your study of the 1876 election here. By the way, the Colorado legislature appointed three Republicans to the electoral college, without which, Tilden would have won. With this rather lengthy introduction, we get to today's news. A group of Colorado citizens have proposed a change to the state's constitution specifying that Colorado's nine electors be apportioned strictly in proportion to the popular vote. 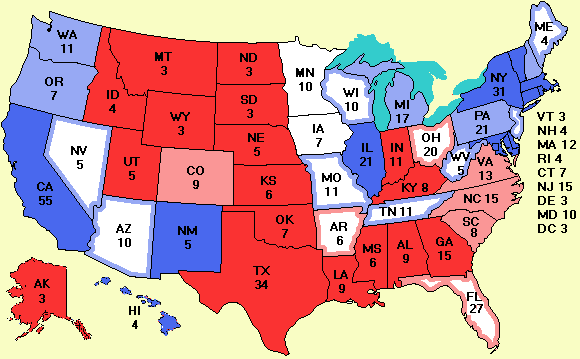 Currently Bush is ahead 48% to 43% there, so under the proposed system, Bush would get five electoral votes and Kerry four electoral votes, instead of nine to zero. The group has turned in petitions containing 130,000 signatures. If about 68,000 of these prove to be valid, the question will be a ballot referendum in November. If it passes, the change takes effect for this year's election. If it makes the ballot, on the evening of Nov. 2, the TV news anchors will probably be saying: "President Bush won Colorado with 55% of the vote, but we don't know how many votes he will get in the electoral college until they finish recounting the closely fought referendum on changing the Colorado state constitution." Whoever loses will appeal to the U.S. Supreme Court, which once again may have to rule on the sensitive issue of state's rights. To learn more about what may be the sleeper issue of the year, start here. A new goodie today is a little icon you can put on a web page that gives the current electoral college score. Whenever the page is loaded or refreshed the browser will fetch the current icon with the electoral college score on it. Unlike the previous one, it does not require Flash and is simpler to install. It is described on the Enhancements page. An example of what it looks like is given at the right. It is also a hyperlink to this site. Spread it around. A new cartoon of the week has been posted.